1: hugonnier-routens (no 138) : double headlights, one powered by batteries, the other by a generator. 2-3: modifications done by No. 281: saddle mount that contains patch kit and oilcan, red taillight brazed onto the frame. Cranks with two-arm spider, double chainrings. 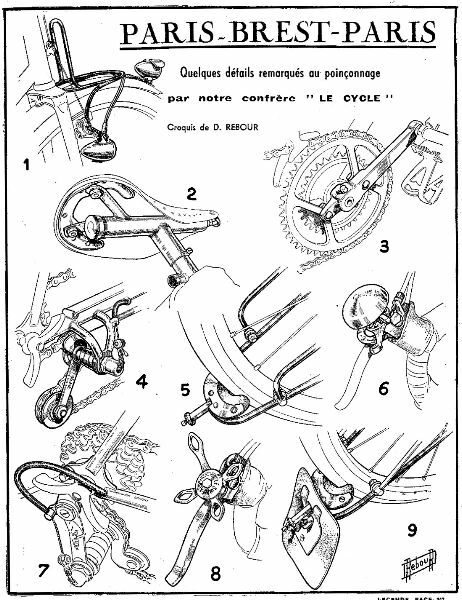 4: remy (no 422) : huret Cyclotouriste derailleur, with adjustable spring tension, on the tandem of Bult�-Dectus. Also of note is the grooved pulley that replaces the lower pulley wheel and its chain guide. 5-9: the maury of maysounabe had some very original ideas, whether they were designed by the constructeur or stemmed from the ingenuity of the rider. the fenders were made from small rubber scrapers (5 and 9), which rubbed against the tubular tire. their pressure was adjustable with a screw. the front wheel (9) nonetheless had a mudflap. the brake levers, with handrests that were generously cushioned with rubber, carried on the right (8) the shift lever shaped like a star, and on the left (6) the remote control for the generator and the bell. In drawing no. 7, we see the elegant solution where the cable for the simplex derailleur enters the right chainstay.